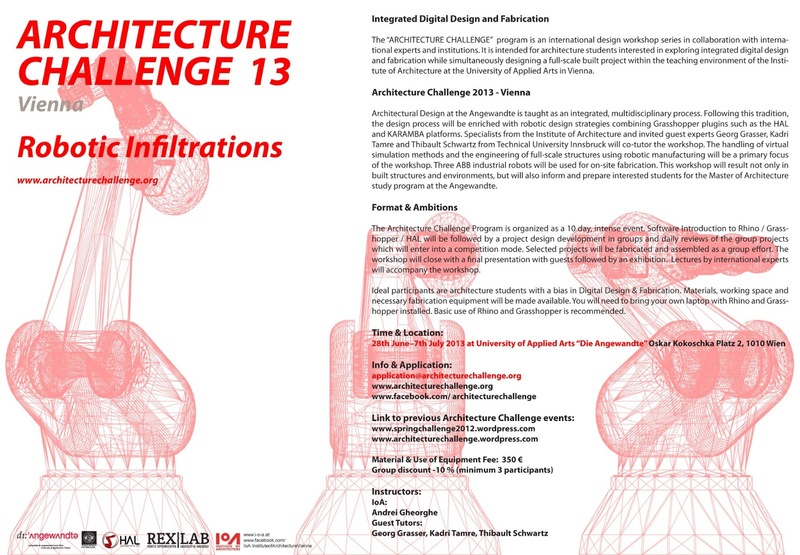 The “Architecture Challenge” program is an international design workshop series organized by Andrei Gheorghe and Bence Pap in collaboration with international experts and institutions. It is intended for architecture students interested in exploring integrated digital design and fabrication while simultaneously designing a full-scale built project within the teaching environment of the Institute of Architecture at the University of Applied Arts in Vienna. Architectural Design at the Angewandte is taught as an integrated, multidisciplinary process. Following this tradition, the design process will be enriched with robotic design strategies combining Grasshopper plug-ins such as the HAL and KARAMBA platforms. Specialists from the Institute of Architecture and invited guest experts Georg Grasser, Kadri Tamre and Thibault Schwartz from Technical University Innsbruck will co-tutor the workshop. The handling of virtual simulation methods and the engineering of full-scale structures using robotic manufacturing will be a primary focus of the workshop. Three ABB industrial robots will be used for on-site fabrication. This workshop will result not only in built structures and environments, but will also inform and prepare interested students for the architecture study program at the Angewandte.